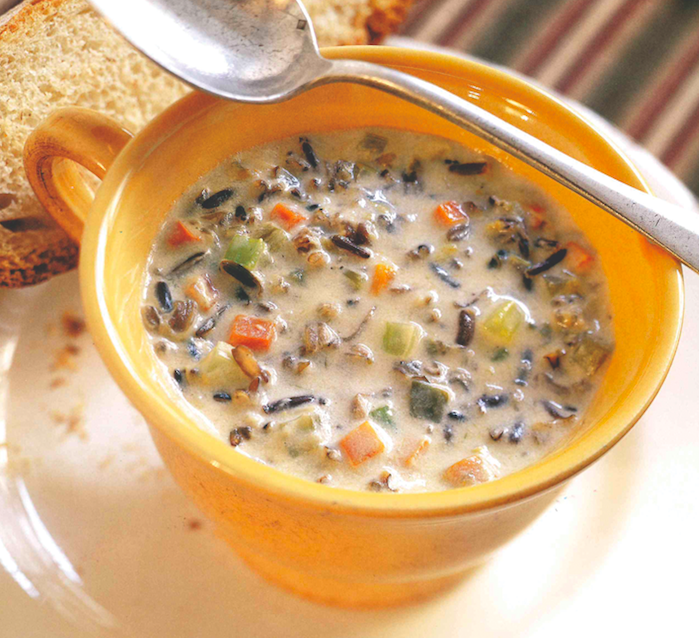 / Our Blog / Warm Up With Wild Rice Soup! Soup is an ideal meal on cold winter days. One of the best things about soup is its versatility. Soup makes a great entree, and it also can serve as a warming appetizer or a delicious side dish. Soup also knows no bounds with regard to ingredients, making it a meal that can be enjoyed several times per week without boring the taste buds. Those who need to warm up this winter may want to try the following recipe for “Minnesota Wild Rice Soup” courtesy of The Culinary Institute of America’s “Book of Soups” (Lebhar-Friedman). Heat the butter in a soup pot over medium heat. Add the carrots, leeks and celery. Cook until softened, about 5 minutes. Reduce the heat to low, add the flour, and stir well. Cook gently, about 3 minutes, stirring constantly. Add the broth gradually, whisking well with each addition to eliminate flour lumps. Bring to a simmer. Add the wild rice and salt. Continue to simmer until the rice is tender but still somewhat chewy, about 45 minutes. Stir in the heated cream and sherry. Season with salt. Serve in heated bowls, garnished with chives and parsley. Place the chicken and water in a large pot (the water should cover the chicken by at least 2 inches; add more if necessary). Bring the water slowly to a boil over medium heat. As the water comes to a boil, skim any foam that rises to the surface. Adjust the heat once a boil is reached so that a slow, lazy simmer is established. Cover partially, and simmer 2 hours, skimming as often as necessary. Add the remaining ingredients. Continue to simmer, skimming the surface as necessary, until the broth is fully flavored, about 1 hour. If using hen or chicken parts, remove them and cool slightly. Dice or shred the meat, and reserve to garnish the broth or save for another use. Discard the skin and bones. Strain the broth through a fine sieve or cheesecloth-lined colander into a large metal container. Discard the solids. If you are using the broth right away, skim off any fat on the surface. If you are not using the broth right away, cool it quickly by transferring it to a metal container (if it’s not in one already) and placing the container in a sink filled with ice-cold water. Stir the broth as it cools, and then transfer it to storage containers. Store in the refrigerator, up to 5 days, or in the freezer, up to 3 months. Label and date the containers clearly before putting them into the freezer. Best Buys for the New Year!